Disk Drill is great for users who need a quick solution, but might not have the depth that true geeks crave. Disk Drill is one of the oldest data recovery software options in the game, having been around in some form or another since 2010. But just because an application has been around a long time doesn’t always mean it’s doing a better job than the rest of the competition, so how does Disk Drill stack up in the rankings? Spoiler Alert: Disk Drill Recovery Pro is fast and easy to use but falls short of top rated products such as Data Rescue 5 which we reviewed here. Read on in our Disk Drill Recovery Pro review to find out what we liked and what we didn’t like. Getting Disk Drill installed on our test system was quick, painless, and took less than three minutes from downloading on the CleverFiles site to having the software activated and ready for its first scan. Disk Drill is one of the more modern-looking data recovery applications I’ve used lately, however it suffers from the same problem as EaseUS in that its minimal design may actually be too minimal for the average user. In order to designate which types of files I wanted to search for on my first scan, rather than having them right up front and obvious I had to dig into the (very limited) preferences menu to find how to scan by filetype only. Then, instead of letting me filter by filetype by typing it in I had to choose individually through an unintuitive tree system that was way more trouble to use than its worth. A notable addition to Disk Drill’s feature list is the Recovery Vault data protection feature, which runs a service in the background of your machine which actively monitors your hard drives for changes or file deletions. It saves the metadata of the files so if you ever want to recover them in the future Disk Drill will have a 100% success rate during the reconstruction process. To test Disk Drill Pro’s data recovery capabilities, we stored (and deleted) five different file types – *.exe, *.jpeg, *.mp3, *.zip, and *.txt – to see how it could recover data from an SSD, an HDD, and a USB flash drive. There was no noticeable impact on our system while we were running the deep scan, and at max Disk Drill only used about 10% of our CPU, 1% of our RAM, and 117.5MB/s on the HDD being scanned. 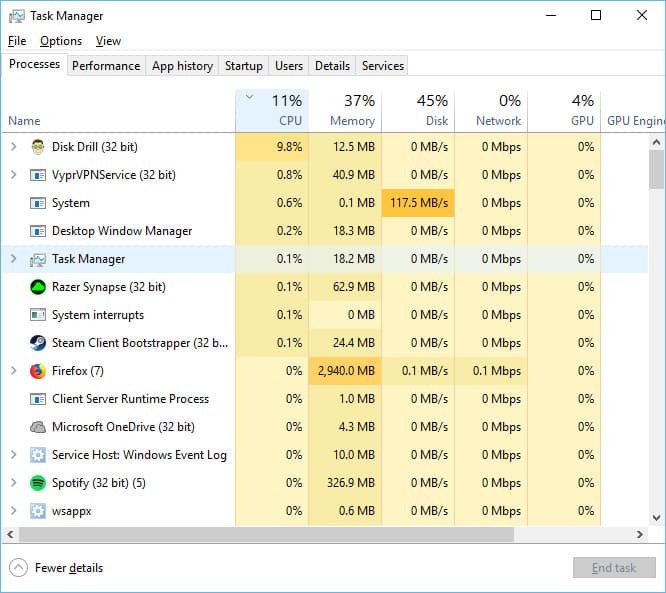 Also although we’re not sure exactly why, as you can see in the screenshot above while Disk Drill was running Windows attributed the increased disk activity to its System application rather than Disk Drill itself. Results returned by Disk Drill Recovery Pro were mixed, with some image and video files getting jumbled up during recovery while other more whole files like .exe and .zip were able to make it out with 100% file health. File preview was equally spotty, and actually couldn’t seem to reconstruct any of the files we had originally deleted. Given that so many other programs have excelled in the preview department, it was disappointing to see so many misses on this side of things with Disk Drill. That said, for both the HDD and the SSD tests the full scan process was suspiciously fast, taking a total of only 36 minutes to complete on the HDD and 13 minutes on the SSD. These results blow the rest of the competition clean out of the water, however we suspect it may be these crazy quick scan times that might the culprit as to why we had difficulty recovering some files in the first place. Of all the data recovery software options we’ve reviewed for this roundup, CleverFiles offers far and away the most options on the free variant of their Disk Drill program. Free users get access to the full range of Disk Drill’s features including the Guaranteed Recovery data protection service, unlimited data backup, and unlimited scans/file previews. The only limitation is the 500MB cap of recovered data, which you’ll have to pay $89.00 at minimum to lift. The Pro license will get you access to all the same features of the Free version without any limit on the amount of data you can recover from any drive. The sticking point here is the three-computer max per user, which is lifted by purchasing a Commercial license for $399. Commercial users don’t have access to any extra features, however they are cleared to install and use the software on an unlimited number of machines while also gaining access to “Priority Support”, though there was no indication on the company’s site or in their TOS of what exactly that means. The creators of Disk Drill, CleverFiles, only has one contact option for help and that was through submitting a ticket on the company’s support page. Oddly however the FAQ also contained a whole list of seemingly unrelated topics like “How to Download Netflix on a Mac” where several external programs having nothing to do with DiskDrill are recommended. My only assumption here is the company was trying to grab particular search terms on Google to up their sales, because none of the extraneous articles I’ve seen on the company’s site seem to relate to data recovery in the slightest. 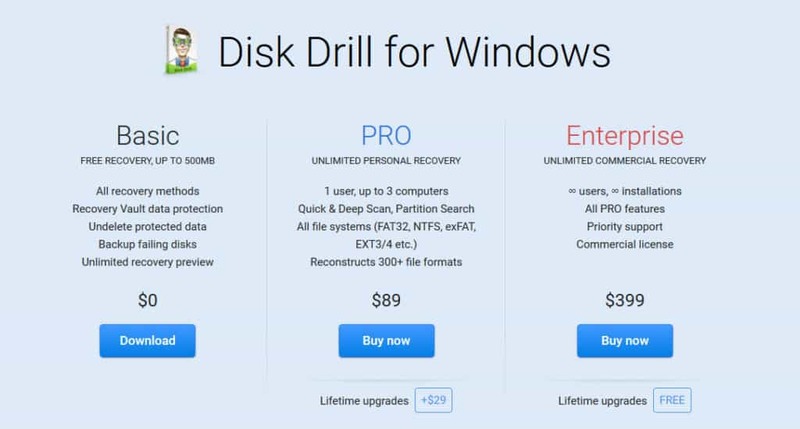 Disk Drill Pro Data Recovery for Windows offers up a friendly user interface and a decent pricing structure, but its mixed recovery results left us with a slightly underwhelming taste in our mouths. Even though this is one of the oldest software solutions in the game, the app itself struggled with simple file previews that other lower-cost data recovery suites nailed, and it straight up missed many filetypes that either couldn’t be found or couldn’t be reconstructed after the first search had finished. That said, the speed and simplicity that Disk Drill offers over its competitors can’t be matched, so if you’re looking for a recovery program that even your grandparents would be able to figure out, then this might be the option for you!